Begin measuring value, not time. We have had the opportunity to speak around the country on the transition to value-based care. Frankly, it is not top of mind for most physical therapists, and given a choice, most of us would much rather talk about something else: the latest clinical techniques, performance-based tests, patient management, our favorite beer, almost anything else. We have been hearing “Value-based care is coming soon” for quite some time, and further, how important it is to prepare for it. But “coming soon” has stretched into years. The vast majority of health care is still paid on a fee-for-service basis. It is a classic parallel with Aesop’s fable of the boy who cried wolf. HHS has set a goal of tying 30 percent of Medicare fee-for-service payments to quality or value through alternative payment models by 2016 and 50 percent by 2018. HHS has also set a goal of tying 85 percent of all Medicare fee-for-service to quality or value by 2016 and 90 percent by 2018. If CMS reaches its stated goal, 90 percent of all fee-for-service payments will be tied to quality in less than two years! The transition to value-based care is already happening, although it may not be apparent to you. Medicare has initiated an interesting strategy of using hospitals and large health care organizations to bear risk and help them manage the transition to value-based care. The Comprehensive Care for Joint Replacement (CJR) and Bundled Payments for Care Improvement Initiatives (BPCI) are both examples. For the first time ever, under these programs, CMS has set up financial incentives for hospitals to improve quality not only for the hospital experience, but also for outpatient care following discharge. You are likely already seeing patients who are being managed under these programs right now without your knowledge. In other words, you are playing the game, but you don’t know the rules, and worse yet, you don’t even know you are in the game. These programs have many similarities and one striking difference. In both programs, hospitals and large health care organizations are paid at a slight discount with a potential bonus payment for controlling cost and improving quality. 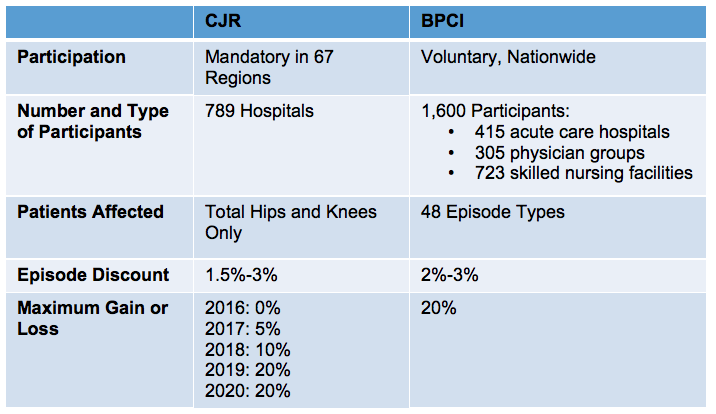 The big difference: BPCI is voluntary, but CJR is mandatory in certain geographic regions. CMS isn’t asking hospitals to participate; they are requiring participation. The incentives put in place are already beginning to change the behavior of hospitals. The hospitals are working with staff physicians to meet these new incentives, and the incentives passed on to physicians will affect you and your practice. Right now, these changes may be largely invisible to you, but they will not be for long. So, one more time: Value-based care is here. The time to prepare is now. Assuming we have gotten your attention, the question becomes what can be done now to prepare. First, you should think about what health care would look like if it was totally value based. Think about the incentives in today’s fee-for-service system and how those incentives will change as we migrate to value-based care. Today, clinicians are paid for the volume of services we provide (what we do); tomorrow we will be paid more for our results and our ability to leverage our knowledge (what we know) to manage a population of patients and coach them to better health. Instead of being paid more for providing more services, we will be rewarded for providing effective care that is efficiently delivered. The “soft skills” necessary to empower patients to take more responsibility for managing their own health will be more important than the technical skills we have spent years learning. In addition, much more of our care will be delivered without physical contact with the patient. Telehealth, effective patient engagement, and remote patient monitoring of all sorts will become increasingly important. Also, we will have to break down the silos between hospitals, skilled nursing facilities, outpatient clinics, and the patient’s home. Working across the silos in our present health care system will become increasingly important. Today, we all tend to focus on metrics that give us an indication of our business health in a fee-for-service system. Since we are all financially rewarded for providing more services, commonly used metrics measure volume, not value. 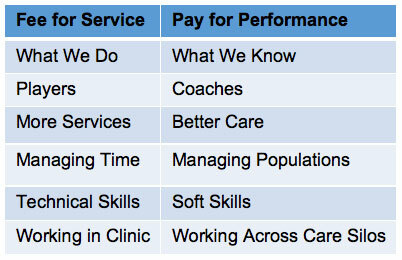 Units/Visit, Visits/Case, Billable Minutes/Therapist Hour are all common fee-for-service metrics. We can all begin measuring for value today by measuring and comparing clinical outcomes compared with cost. Measuring average improvement by using a patient-reported outcome score or performance-based clinical finding per visit would be a good start. For example, Avg Oswestry Improvement/Visit for patients with low back pain. But an important caveat: To make these metrics meaningful, you must have a workflow in place to make sure that you are measuring all of your patients. I too often see patient-reported outcomes being collected from initial evaluation through discharge on patients who complete their plan of care. It will become just as important to collect this data on patients who drop out of care early for it to be meaningful. Finally, preparing for value-based care is simply not going to be possible without systems to manage patient engagement, outcomes, clinical quality, and cost. In particular, comprehensive patient engagement systems that allow therapists to manage their caseload both within and outside of your clinic walls are going to be a critical key to success. As patients’ rating of the service and improvement provided by those services becomes part of the factors included in value-based reimbursement, keeping your patients engaged will become as critical as documenting their plan of care. The times are a-changing. And the wolf is at the door. Evidence-based practice is a little like a good diet: Although everyone agrees that a good diet is important, there still remains a lot of disagreement regarding what constitutes a healthy portion. Everyone agrees that evidence-based practice is a good thing. Everyone should be doing it. But, very few of us actually incorporate evidence-based practice guidelines in our day-to-day practice. The internet and electronic medical record (EMR) technology make incorporating evidence into your clinical practice much easier. To start off, begin including relevant evidence citations in your documentation that support your plan of care. You can develop a library of these citations that can be pasted into your documentation, or you may develop documentation templates that include relevant citations. 1. https://innovation.cms.gov/initiatives/Health-Care-Payment-Learning-and-Action-Network/. Accessed December 2016. 2. www.cms.gov/Medicare/Quality-Initiatives-Patient-Assessment-Instruments/Value-Based-Programs/Value-Based-Programs.html. Accessed December 2016. Doug Schumann is the vice president of client success at Clinicient. He may be reached at dschumann@clinicient.com. Jerry Henderson is the vice president of therapist success at Clinicient. He may be reached at JHenderson@clinicient.com.